How can I go fishing in Mongolia? There are two approaches to fishing in Mongolia, you can fish independently, or you can go on a guided Mongolia fishing tour. There's an official rule in Mongolia that foreign tourists must be accompanied by a licensed outfitter in order to go fishing in Mongolia. That means an independent fisherman is technically breaking the law if they attempt to fish unaccompanied. Signs at the airport tell you as much. But I'm not going to lie to you and tell you that means it doesn't happen, or that I haven't done it myself. There is the federal ruling, and then there is the reality on the ground: the wildlife officers in the regional soum (village) centers generally seem happy issuing foreigners with official permits. They, after all, are the same guys who will be catching you if you aren't playing by the rules. At a minimum, you need these local permits, if you don't have one you could be fined, have your gear confiscated, have to pay a bribe or be locked up temporarily -god only knows. So i really would insist you get the local permit as a minimum. That's the way I have fished in Mongolia on a number of occasions. Even if you have a local permit, there's still a risk that somebody, somewhere, is going to have an issue with foreigners fishing unaccompanied. If a professional outfitter, who has to pay hefty license fees to the government, finds an independent angler on their patch of river then they may chase you off or even haul you in front of a sympathetic official. So if you want to go fishing independently in Mongolia you do it at your own risk. c)for you, fishing in Mongolia is more about traveling around the countryside than hauling in large numbers of fish; your fishing pole is as much an excuse to get out and see the natural surroundings. If you catch a few fish then 'great', but if not you had a great time regardless. Mongolia fishing independently will certainly save you a lot of money. It's also great to just have your fishing pole along in your backpack so you can go for a flick each evening after a day's trekking or horse riding. I love the solitude of just being alone in a new environment now and again. Now for the downsides, and the reasons I don't believe the professional outfitters should feel threatened by independent foreign fishermen: there aren't many of them, and they barely catch anything! The greatest negative is that with your lack of knowledge of local conditions or people to cook and set up camp for you, you'll spend a lot of time stuffing around with logistics and a lot less time with a line in the water. You are also unlikely to catch a third of the fish you'd catch with a qualified guide. You won't know what flies or lures to use at which time, you won't know which river is fishing best at the moment, where the best spots and stretches are, etc. You will also struggle to reach the best out-of-the-way fishing destinations unless you can manage and pay for the logistics. You'll spend half your time setting up camp, cooking etc. when you could be fishing. I've had some very frustrating occasions in Mongolia where i've tried everything, and still not caught a single fish, simply because i didn't have the right lures or patterns. But for me, that doesn't really matter that much. So, if you have more time than money, and just want to give fishing a crack now and again, then independent fishing may be for you! I love it! Remember: tread lightly, use de-barbed hooks, and Taimen should ALWAYS be released. Mongolian boy with a small Lenok on the beautiful Hovd river. A guided fishing tour in Mongolia is certainly the way to go for the dedicated fisherman, or those with more money than time. You'll have all the logistics taken care of to get you to the best spots without you even having to worry. Internal flights, transport, food, accommodation will all be part of the package. They'll know exactly what's biting, where they're biting, and what they're taking, maximizing your chances of a successful Mongolia fishing trip. You're also more likely to be taken to some more remote, untouched and plentiful fishing locations. If you're serious about your Mongolia fishing, this is really your only option. You can always tack on another tour at the end of your trip if you want to see other parts of Mongolia. 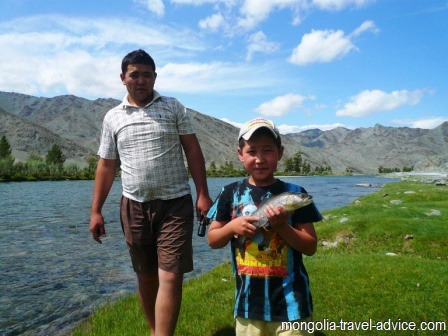 These guided fishing trips in Mongolia are generally relatively expensive affairs, involving remote (i.e. expensive to get to) locations and foreign-owned outfitters required to pay significant licensing costs to the government (which are of course reflected in your fees). Once the transport costs are factored in, fees are pretty comparable to guided fishing in places like Argentina, New Zealand, etc. But hey, the fishing IS world class. Unfortunately there aren't really 'budget' Mongolia guided fishing options that sit somewhere between struggling by yourself, and paying a lot for a fully-catered foreign outfitter. That's just the way it is Mongolia fishing; mostly due to a rigidly regulated outfitter industry. As a generalization, even with a quality outfitter, don't expect the guides to give you amazing tips on improving your technique. For most, guiding just consists of pointing out where the fish are lying, and telling you what patterns or lures to throw at them. The Chuulut. In flood. There's nothing more heartbreaking than going to a remote Mongolia fishing spot and finding the conditions are poor. Where to go fishing in Mongolia? Don't expect the Outfitters to publish the rivers they fish online! Lucky, for you, you have my site. To learn the lie of the land, you should see my rivers in Mongolia page to get a better understanding of the major drainage systems and their geography. The best place to go fishing is Central and Northern Mongolia, simply because of the watershed volumes and number of rivers in the catchment. Luckily, this region is relatively close to Ulan Bator. 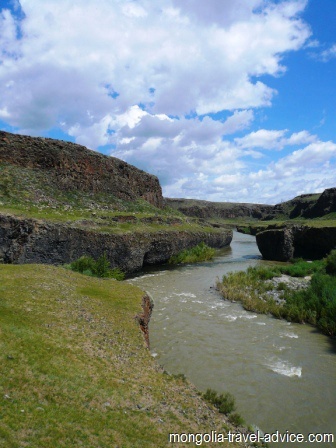 There are is also some good fishing over the Khentii mountain range to the east, on the far side of Terelj National park, with these rivers draining into the Pacific Basin. The Altai mountains in Western Mongolia have some pretty good Mongolia fishing for Lenok and Grayling if you happen to be traveling over there, but the mighty Taimen is not present and so the region isn't a destination for dedicated anglers. (On the bright side, no outfitter is going to worry about you fishing on your own there!). Darhad Valley (West of Khovsgol): a number very remote wilderness rivers. Very hard to reach without an outfitter. Chuulut river. I fished here after renting a jeep from Tsetseleg, but it was in flood and I didn't have much luck. Need to go back! Egiin river (sometimes pronounced 'Egg' river, drains out of lake khovsgol is known as a good Taimen river. I fished there just spending a day walking from Khatgal. A few mates have since gone and made a few days of it, hiking downriver and camping, they had a great time. The Ider, Delgermoron, Chuulut, Bugsei and Selenge all meet in a remote spot called the Five Rivers region, which is supposed to have excellent fishing for miles around. You can get there from Moron or Tsetserleg for some top Mongolia fishing. I attempted to hire a jeep to get there in 2011, but recent heavy rains had made the peaks impassable. The Tsuman river which flows into White Lake near Tsetseleg is reputed to have Taimen, but I fished the hell out of it all I did was lose a lot of gear on the porous volcanic rocks which fill it; it was great hiking down but I wouldn't recommend it for fishing. The Onon and Kerlen rivers are relatively close to Ulan Bator and are reputed to have some of the best fishing in Mongolia. I caught so many Lenok in the Hovd and Tsaagan Us rivers, which was far preferable to all the Mongolian mutton we were living on. Lenok are like a good Rainbow trout. But there aren't Taimen around so serious anglers would go elsewhere. Fish away from populated areas which is harder to do than you might think over summer, as every family moves out of the towns and erects summer gers allover the countryside. An outfitter will definitely get you to a remote wilderness spot. Otherwise you're just going to have to be mobile, and get at least a few hundred metres away from permanent habitations and villages. Mongolians are increasingly getting into their fishing and catch and release is a foreign concept, so populated areas do fish lean at times. You don't have to go far to get away from them, though. For a people who grow up in the most sparsely populated country on the planet, Mongolians sure know how to crowd out an angler. Frustrating at the time, but strangely endearing in retrospect, are the number of occasions when the whole river's been empty but some local's seen fit to stand a few meters upstream of me and cast across my line as if it was the most normal thing in the world. You move a few meters down and they follow you! Such are the strange contradictions in personal space for a people who grow up on the wide open steppe, but live within a crowded ger. Best way to avoid these anthropological wonders is to just steer clear of villages, or go with an outfitter. Be careful with your gear as it can just be too tempting for a local who's wondering around fishing with nothing but a bamboo pole with line on the end. I left my leatherman by the Tsagaan Us river for about 5 minutes after cleaning a fish once; i came back and it had disappeared along with the local boys who were fishing nearby. I am still smarting from the loss but I suppose the local kids got more use out of it than I ever would. If you're cleaning a fish you will find you can fling the viscera in the air and watch the buzzards (who always turn up at these moments) fly in and catch the offerings in mid-air. Be careful though, as it can embolden them to fly down and rip a fish straight from your hands (no exaggeration here!) when you have your back turned. Fish left on the bank are waiting to be taken by these greedy raptors. Continue on to Part 2 to learn when to go, and what to take.